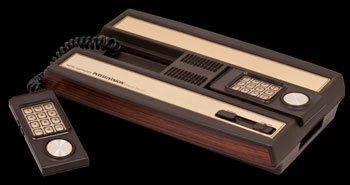 I never owned an Intellivision as a kid, whenn they originally came to market. I was all about Atari and couldn't afford the system or buying games for the 2600 as well. A friend of mine got one for Christmas, but I saw most of the games a s knock-offs of my Atari favorites. They did excel at sports titles, but that may have been a conclusion based on how truly awful Atari sports games were. The Intellivision was developed by Mattel Electronics, a subsidiary of Mattel formed expressly for the development of electronic games. The console was test marketed in Fresno, California, in 1979 with a total of four games available, and was released nationwide in 1980 with a price tag of US$299 and a pack-in game: Las Vegas Poker & Blackjack. Though not the first system to challenge Atari, it was the first to pose a serious threat to Atari's dominance. A series of advertisements featuring George Plimpton were produced, that demonstrated the superiority of the Intellivision's graphics and sound to those of the Atari 2600, using side-by-side game comparisons. By 1982, sales were soaring. Over two million Intellivision consoles had been sold by the end of the year, earning Mattel a $100,000,000 profit. Third-party Atari developers Activision, and Imagic began releasing games for the Intellivision, as did hardware rivals Atari and Coleco. Mattel created M Network branded games for Atari and Coleco's systems. The most popular titles sold over a million units each. The Intellivision was also introduced in Japan by Bandai in 1982. Intellivision's packaging and promotional materials, as well as television commercials, promised that with the addition of a soon-to-be-available accessory called the "Keyboard Component", originally portrayed in TV ads as a larger box with an opening in the top that the Intellivision fit into. This would turn the Intellivision into a fully functional home computer system. In the fall of 1982, the LUCKI, now renamed the Entertainment Computer System (ECS), was presented at the annual sales meeting, officially ending the ill-fated Keyboard Component project. A new advertising campaign was aired in time for the 1982 Christmas season, and the ECS itself was shown to the public at the January 1983 Consumer Electronic Show (CES) in Las Vegas at the Las Vegas Convention Center. A few months later, the ECS hit the market, and the FTC agreed to drop the $10K/day fines. Unfortunately, by the time the ECS made its retail debut, an internal shake-up at the top levels of Mattel Electronics' management had caused the company's focus to shift away from hardware add-ons in favor of software, and the ECS received very little further marketing push. Further hardware developments, including a planned Program Expander that would have added another 16K of RAM and a more intricate, fully featured Extended-BASIC to the system, were halted, and in the end less than a dozen software titles were released for the ECS. In 1982, Mattel introduced a new peripheral for the Intellivision: The Intellivoice, a voice synthesis device which produces speech when used with certain games. 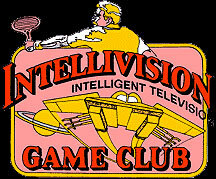 The Intellivoice was original in two respects: not only was this capability unique to the Intellivision system at the time (although a similar device was available for the Odyssey2), but the speech-supporting games written for Intellivoice actually made the speech an integral part of the gameplay. Priority: Selects whether sprite appears in front of or behind background.